The best and most versatile album thus far from a great band that continues to impress and evolve. There was no album this past year I was more excited about hearing than Imaginaerum. The second Nightwish album to feature Swedish-born vocalist, Anette Olzon, the band has definitely grown immensely from the more operatic elements of the past. The addition of Olzon has allowed Nightwish to explore different rock styles that were not possible with former operatic vocalist, Tarja Turunen, and they sound better than ever. The album itself is grand and sounds more like a movie score than merely just a concept album. The orchestrations are incredibly well-arranged and mixed, and this is without a doubt the best mixed Nightwish album so far. Before the album’s release, a big concern for me was hoping that the band wouldn’t just rehash the previous release, Dark Passion Play. While Nightwish have a signature symphonic metal sound, you never want to fall into the trap where a lot of the music sounds the same. I believe the new album follows a signature Nightwish template — staying true to itself, yet it has a lot of great sonic elements that Dark Passion Play did not have. Imaginaerum is, dare I say, the band’s most musically progressive work to date. Unlike its predecessor, Imaginaerum delves into not only classical and symphonic metal, but also folk music and… traditional jazz! Even though some of the musical styles change, it’s done effectively and cohesively. The song “Slow, Love, Slow,” is one of my favorites and, in my opinion, one of the most noteworthy on the album. Tuomas Holopainen, the primary songwriter and bandleader, definitely deserves a tip of the hat for the evolution of his songwriting. The album opener, “Taikatalvi,” is a great Finnish lullaby that instantly captivates. This segues immediately into the first single, “Storytime,” which is quite catchy and immediately is reminiscent of classic Nightwish: epic, cinematic, power metal (however, the lead vocals were mixed a bit too low. Oh well). The second single, the bagpipe, folk drenched, “The Crow, the Owl and the Dove,” is even catchier and marks another turning point of the album. The folk aspect of Imaginaerum showcases a beautiful side of the band, and it also allows for some soothing movements in between the power metal masterpieces they are renowned for. It’s definitely refreshing to hear some great lead playing by Emppu Vuorinen, despite the fact he has no writing credits for the album. The song “Ghost River” has an intro reminiscent of Van Halen’s, “Ain’t Talkin’ Bout Love,” and it was nice to hear him step out of the rhythm guitar box and show off his obvious lead chops. One of my issues is the repetitiveness of some of the tracks. The album is very long — too long, at one hour and fourteen minutes. With several seven minute songs, a few instrumentals, and the thirteen minute long epic, “Song of Myself,” Imaginaerum can be a bit much to handle, and will repel listeners. While the album is indeed an opus and has a cohesive layout, we believe that some of the tracks were unnecessary and should have been pulled to bring better pacing to the album. Regarding the mixing and mastering, I would have liked the lead vocals to be mixed just a bit more in the forefront of the otherwise excellent mix. But part of what makes it hard to listen to this magnum opus from start to finish is the disappointing mastering, which sucked the dynamics out of the orchestral performances in its quest for optimal ear bud listening. German rockers continue to deliver melodic, modern prog with universal rock appeal. Beyond Man and Time is the eighth studio album from RPWL, and fans of their Gilmour-era Pink Floyd vibe will be right at home with the latest release. Not to make you think they sound like a Floyd clone — because they are far more than that — RPWL paint a dreamy musical landscape with jangly acoustic guitars drenched in echoes, beautiful vocal harmonies, keyboard solos, and blues-inspired guitar leads. Beyond Man and Time is a concept album on which the band explores a bit more musical variety than previous, recent output. We loved the Simple Minds-inspired opening and bridge in “Unchain the Earth,” which really gave the song a modern rock vibe while simultaneously morphing into a moving, up-tempo song in the vein of Pink Floyd’s “Momentary Lapse of Reason.” Another great diversion into modern rock-meets-prog is the up-tempo “The Shadow,” which opens with some cool electronic percussion, gets rocking, and then eventually morphs into a beautiful acoustic guitar segue before Kalle Wallner unleashes some cool slide guitar soloing. The CD straddles a great line between art rock, prog rock, and modern rock that makes it universally appealing. If you’re new to the RPWL experience, this is certainly a fantastic place to jump in and discover them. The songwriting, performance, and production are all strong throughout, and we have nothing to fault about this release whatsoever. Perhaps our only wish is for the band to continue further branching out from familiar musical territory into some new song structures and perhaps get a little bit heavier here and there. The Intersphere — Hold On, Liberty! Solid, catchy, alternative rock with just the right amount of emo angst and high performance standards. Yet another German band made our review column this month, but in sharp contrast to the precision song crafting displayed by fellow countrymen, the prog rockers RPWL, The Intersphere deliver powerful rock songs that will appeal to fans of catchy, emo-derived rock tunes who don’t need to get cerebral with their music. The Intersphere’s third CD, Hold On, Liberty!, is sure to appeal to fans of alternative rock in the vein of Jimmy Eat World, Panic! at the Disco, Fall Out Boy, etc., but who are looking for something with a bit less emo and a bit more alternative rock flourish. Just when we were contemplating if The Intersphere were fresh or merely derivative of other emo-esque bands, “Parallel Lines” hit us with its orchestration and clean guitars, and the album closer, “Destination” had a cool retro vibe with its reverb drenched vocal harmonies. This CD is remarkable for many reasons. First is that the musicianship is excellent, and we love bassist What’s-his-name’s creative use of overdrive in just the right places. Guitarist Whoever-he-is makes good use of a wide range of guitar tones, effects, and he knows how to play angst-ridden alt rock while still delivering a tightly executed and clean performance. The whole band is tight, and the vocal style of That-dude-with-the-mic is well suited to the style. We’re also impressed that this is a very live sounding album, and it’s very well mixed and mastered. The band worked things out well in preproduction and then set to recording the album, mostly live, in the studio in just one week, leaving rough edges here and there to produce a very live and in-your-face album, for which they succeeded quite well. But if any of these guys want some kudos for their contributions to the whole, the band needs to do a better job of actually identifying who plays what, since there’s no reference to the band members on their own website or a few social media sites we investigated in our attempt to bestow some praise. Regardless, if you enjoy modern alternative rock, Hold On, Liberty! definitely rocks. A must-read for any band or musical artist trying to make or maintain a career in the digital millennia. This month brings us an update to a book we hailed two years ago as the most important book we’ve ever read about the music business — Bobby Owinski’s essential Music 3.0. Whether you’re a professional musician in a well-known band that started back in the ‘80s or you’re trying to break the latest band, if you’re over 30 years old, you need to read this book! And if you’re just getting your career started, you need to read this, too, since you don’t really know what’s going on yet, either. Music 3.0 talks about the new ways to market and distribute your music, how to use social media effectively, how to actually make money, who is important on your business team, and more. For example, did you know that the record label is now the least important piece of the puzzle today for all genres other than rap? That’s a sharp contrast from those years you’ve spent in pursuit of a record deal as the almighty end game. And radio? Television exposure? Those things aren’t even remotely as important as they used to be, either. Critical to your success today is building your fan base, or your tribe. Understanding the behavior of your tribe, leading it, and growing it, are just some of the very key topics covered in this book. 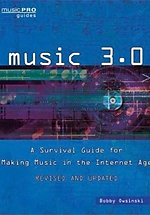 Given how rapidly things continue to evolve in the music world, it’s great that Owsinski updated this book. Virtually every chapter has undergone revision, and new content has been added as well. So, although we can’t say, “Forget everything you think you remember from the first version of this book,” we can definitely say that this book is a must read, and if you own the first edition and refer to it for guidance in these murky music waters, this is one update you don’t want to skip. Want a taste of what this book is about? Read Owsinski’s guest editorial, “How To Make Money In Today's Music World,” reprinted with permission from this 2nd edition. An admirable, powerful, and energetic collection of brash growing pains. Allow me introduce to you: Ashbird, a four-piece metal band from the UK that has the vigor of Megadeth, the tone of Dream Theater, and musical influences ranging from ‘80s hair bands to classic Ozzy and Metallica to the grunge efforts of Pearl Jam, which are ultimately both the appeal and blunder of the band depending on your taste. There is no question that their musicianship is impressive. Each member plays well beyond their years (most the group is in their early 20s) — especially guitarist, Matt Chalk, who shows glimpses of John Petrucci and Randy Rhodes particularly in the closing track, “Hypnotize,” where his display of technique, musical vocabulary, and style are nothing short of outstanding. Vocalist Aaron Burke is a strong rock vocalist in the making, sounding like a cross between Eddie Vedder and Ozzy Osbourne with a touch of Chris Cornell thrown in for good measure. Chalk is not merely the guitarist for Ashbird, either. He is quite the Renaissance man, showing his versatility by producing, engineering, mixing, and doing the cover art for the album. The quality of the recordings is first-rate. The mix is just what it should be, too. And the album art is pretty cool. But, the overall production values are a bit lacking. Rhythmic patterns and progressions are predicable and tend go on for prolonged periods. Five of the nine songs exceed five minutes apiece, with two others coming close. The problem is not necessarily the lengths of the track, because anyone familiar with progressive metal knows that bands like Dream Theater, Porcupine Tree, and Opeth deliver some of their finest work in their longest pieces, but the substance of these tracks are the hindrance of Ashbird. Don’t expect any of songs off of Edge of Reality to reinvent the wheels of Metal. In all fairness, “Hypnotize” does give Chalk more room to roam and assault his fretboard for a little over a minute, which is certainly compelling and jarring guitar work. It would be nice to hear more of this throughout the record, however. Let the freak flag fly, guys. Play your hearts out. You obviously have the chops. The future is bright for this young band, though, as they have the raw talent and sound to deliver some fine modern metal, and the existing song base is certainly a decent enough place to start. To their further credit, The Edge of Reality is better than many metal records released by players ten years their senior. Moving forward, some external production influence might really help these guys take things to another level. It will be interesting to hear how Ashbird progresses as songwriters over the coming years. We’ll be keeping an eye on them.